Melody Rosewood loves her new home in idyllic Sandcastle Bay. The beautiful little cottage on the edge of Sunshine Beach, with its bright yellow door and view of the sea has captured her heart. And she loves being close by to her family and best friend Tori Graham. Gorgeous Jamie Jackson, with his cheeky grin and adorable puppy, works as a sculptor opposite Melody’s jewellery shop. From the moment he and Melody meet sparks fly. But despite their instant attraction, a past heartache is holding Jamie back. As Melody starts to make a life for herself in the close-knit, quirky seaside community, she realises Jamie could be the one for her. But as the two of them take a chance on romance, it’s one dating disaster after another. Are they destined to always be just good friends? Or will Melody finally find her happily-ever-after in Sandcastle Bay? What I Say.....Just a relaxing, feel good book. 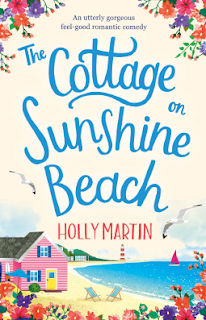 Holly Martin's books are such a great escape. Melody moves to Sandcastle Bay to be near her sister, who is busy raising her nephew. Her best friend, Tori lives close by, having found love in the little village. Melody is crushing hard on Jamie, the sculptor in the shop across from hers, but they are both so shy around each other, it seems like they will never move forward. I blame Holly Martin and Jill Mansell on my continued single state. I keep waiting for true love to just appear in front of me. They make it seem so easy! But even if it doesn't improve my love life, a Holly Martin book always improves my weekend!